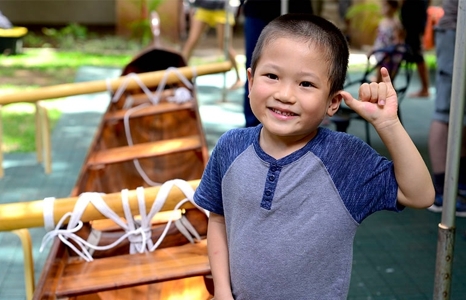 Be inspired by the homegrown talent in the exhibition Artists of Hawai‘i 2017 and make your own mark to the sounds of the Air Force Band of the Pacific. Chasing rainbows: Kids will make a changing scene using two differently colored plates. Intertidal scenes: Taking inspiration from Artist of Hawai‘i Kasey Lindley, kids can work with the artist to make creative collages using photographs of intertidal scenes. The royal treatment: Royal Hawaiian Band Glee Club takes the stage to sing with hula accompaniment from 11:15am to12:15pm. Strings and things: Hear violinist Duane Padilla and friends play a medley from 12:30 to 1:15pm. Soaring sounds: Listen to the world-class Air Force Band of the Pacific play from 1:30 to 2:30pm. Directed by Michael Q. Ceballos. Guam/Hawai‘i. 2015. 35 min. Chamoru with English subtitles. Based on a Chamoru legend, Maisa tells the story of a girl who finds the strength to lead the women of Guåhan (Guam) into battle against a giant creature from the Marianas trench that is devouring their island home. 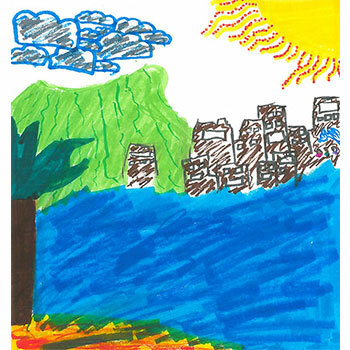 Congratulations to this month's winner: Emma Zakahi, age 10, of Honolulu.